WASHINGTON — After European ministers finalized plans for future launch vehicles in 2014, the French space agency, CNES, plans to focus in 2015 on climate science in advance of a major climate change conference in Paris late in the year. In a speech at the French Embassy here Jan. 15, CNES President Jean-Yves Le Gall said that his space agency has adopted climate as its major theme for 2015, emphasizing the role that spacecraft play in monitoring the planet’s climate. “This year, we have chosen ‘Space for Climate’ as the CNES mantra as we seek to put climate at the center of our space policy,” Le Gall said. That effort, he said, will culminate in December as Paris hosts the 21st yearly session of the Conference of the Parties to the 1992 United Nations Framework Convention on Climate Change, also known as COP 21. Le Gall said he would use the event to emphasize the importance of space in providing data to inform policymakers. In an interview prior to his speech, Le Gall emphasized the importance climate science will have for his agency in 2015 because of the COP 21 conference. “We will insist on the fact that space is very important to understand and to monitor the climate,” he said. One of the milestones CNES expects for climate science in 2015 is the launch of Jason-3, a joint mission with NASA to measure the height of the ocean surface. The spacecraft is scheduled for launch in mid-2015 on a SpaceX Falcon 9 rocket from Vandenberg Air Force Base in California. 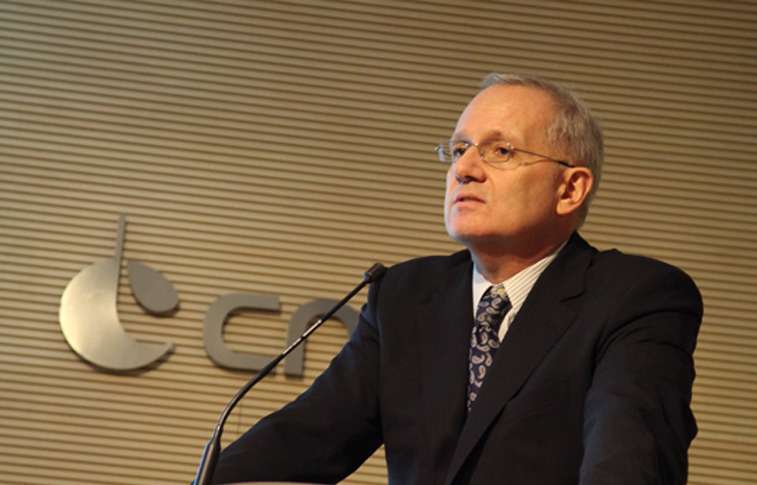 Le Gall also cited the agreement between CNES and NASA in May 2014 to jointly develop another climate science spacecraft, the Surface Water and Ocean Topography mission, planned for launch in 2020. “Cooperation with NASA is part of the DNA of CNES, and we will continue it,” Le Gall said. The new CNES emphasis will be displayed in other venues as well. Le Gall said the agency’s pavilion at the Paris Air Show in June will be devoted entirely to climate science. Le Gall said 2015 will also be used to build upon two major successes of the previous year: the approval by European ministers in December of developing the Ariane 6 launch vehicle, and the arrival of the European Space Agency’s Rosetta spacecraft at comet 67P/Churyumov-Gerasimenko, including the landing of the Philae spacecraft on the comet’s nucleus in November. “This latest decision is truly historic,” Le Gall said of the decision to proceed with the Ariane 6. The modernized, simpler design of the vehicle, along with a “reshaped” role for industry in its development, should reduce launch costs by about half compared with the Ariane 5, he said. Le Gall was also optimistic that Philae, which stopped transmitting shortly after landing on the comet when it exhausted its batteries, could revive this year when sunlight hits its solar panels and recharges its batteries. “By March, we will be able to turn its instruments back on,” he said.